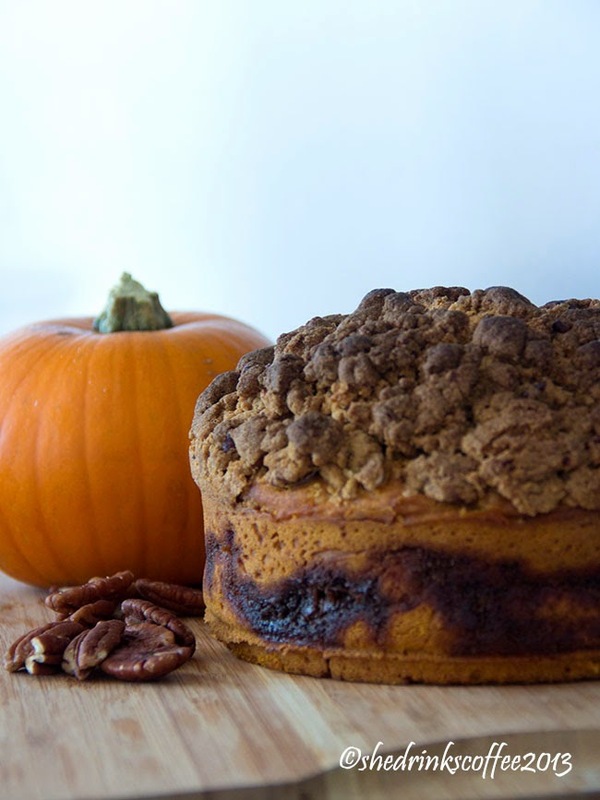 The season of the Great Pumpkin is upon us, and what better way to celebrate than with cake? 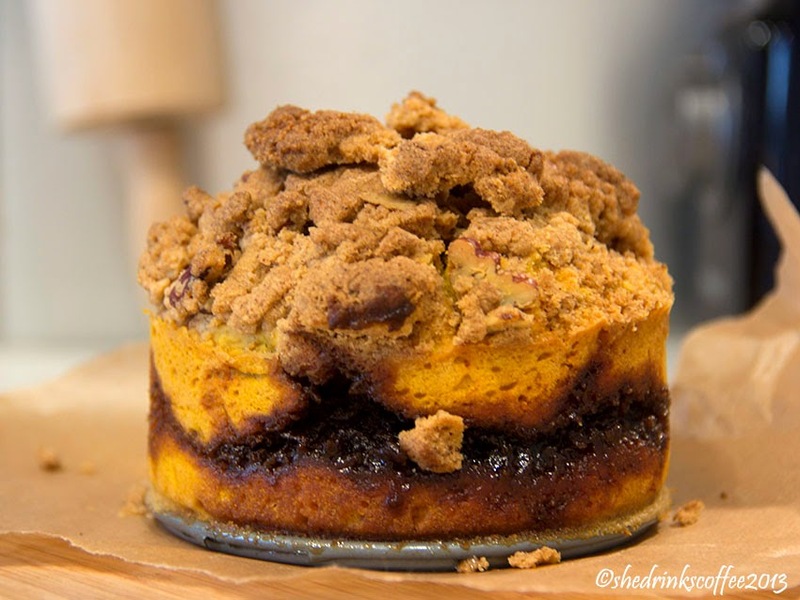 Pumpkin Streusel Coffee Cake to be exact. No, there is no coffee in this cake. Rather, it is to be enjoyed with coffee. Or tea. Or hot apple cider. With the beverage of your choice, basically. Or, heck, even ice cream if you want to go wild. We'll start with the cake batter. 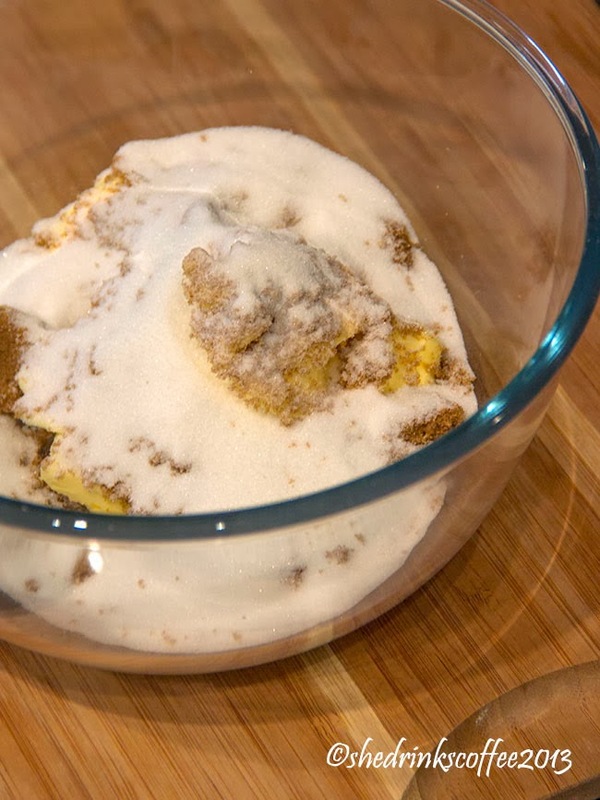 In a large mixing bowl blend together the room temperature butter, the caster sugar, brown sugar, and vanilla. I recommend using a handheld electric mixer, but you can get fancier if you'd like! 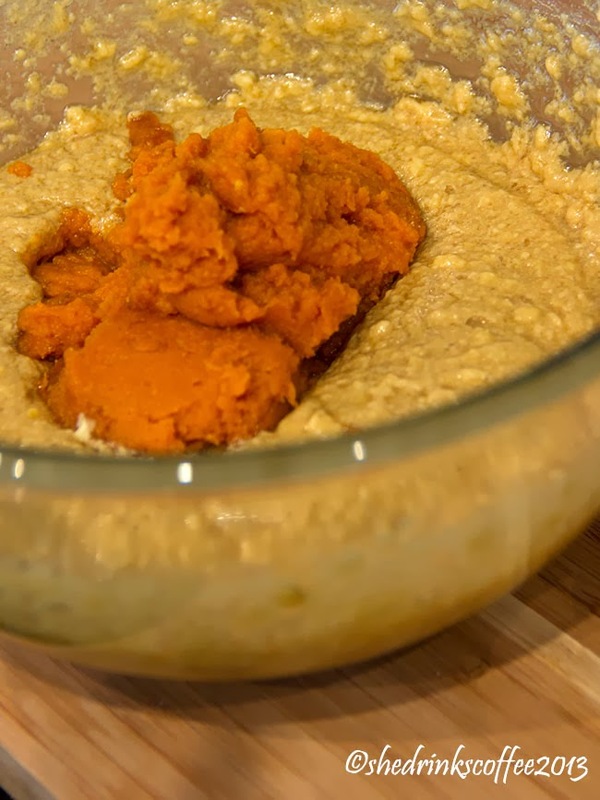 Once the butter and sugar are thoroughly creamed, add the eggs, buttermilk, and pumpkin puree. 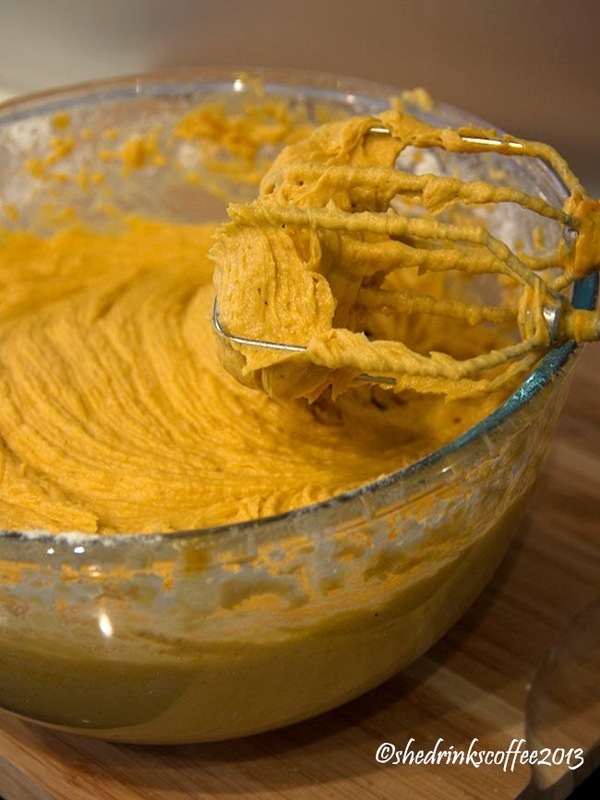 In a separate bowl, mix together the flour, baking soda, and pumpkin pie spice. Then gradually add this dry mixture to the wet mixture. Once combined, pour (or spoon/spatula! - this is a pretty thick batter!) half of the cake batter into a buttered cake tin. 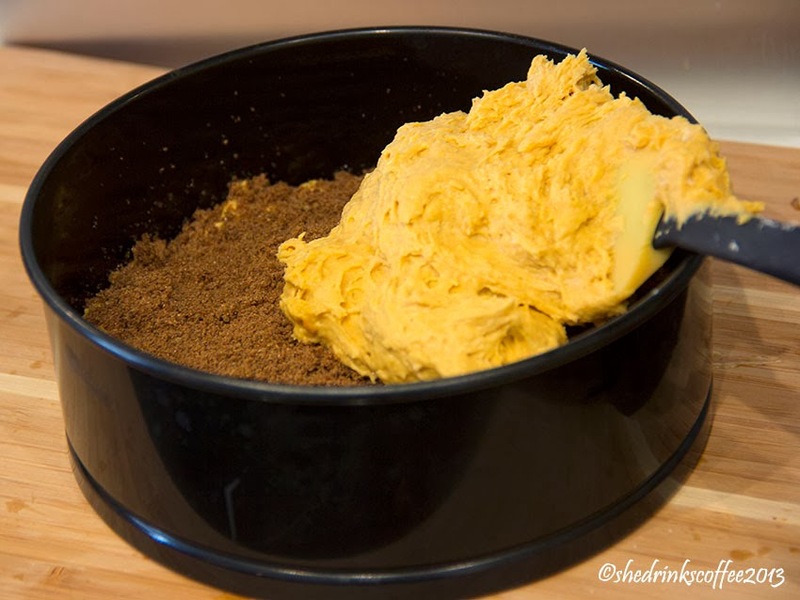 Mix the filling ingredients - the brown sugar, cinnamon, and pumpkin pie spice - together and sprinkle over this first cake batter layer, covering thoroughly. Then spatula the remaining cake batter over the filling layer, smoothing the top down when finished. 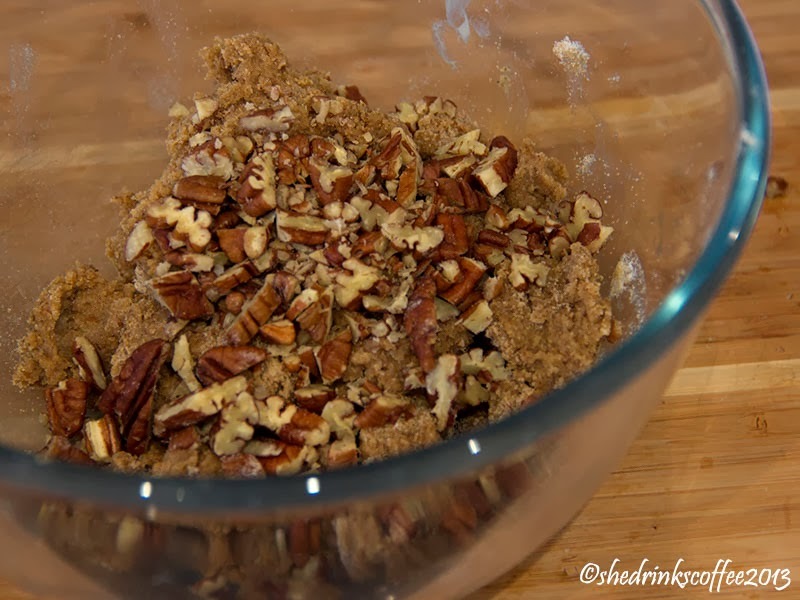 Finally, mix together the topping ingredients - brown sugar, flour, chopped pecans, and melted butter. 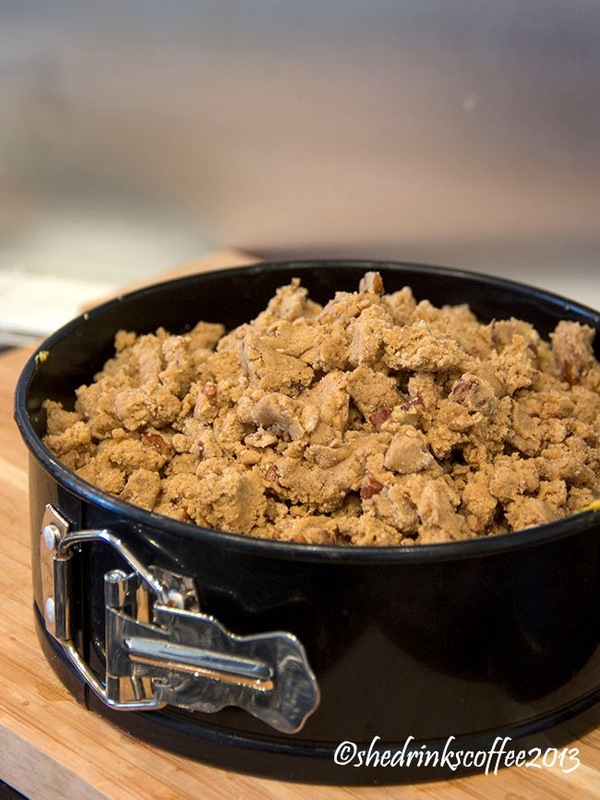 You can do this with a fork or by hand, until the topping mixture starts to clump together. 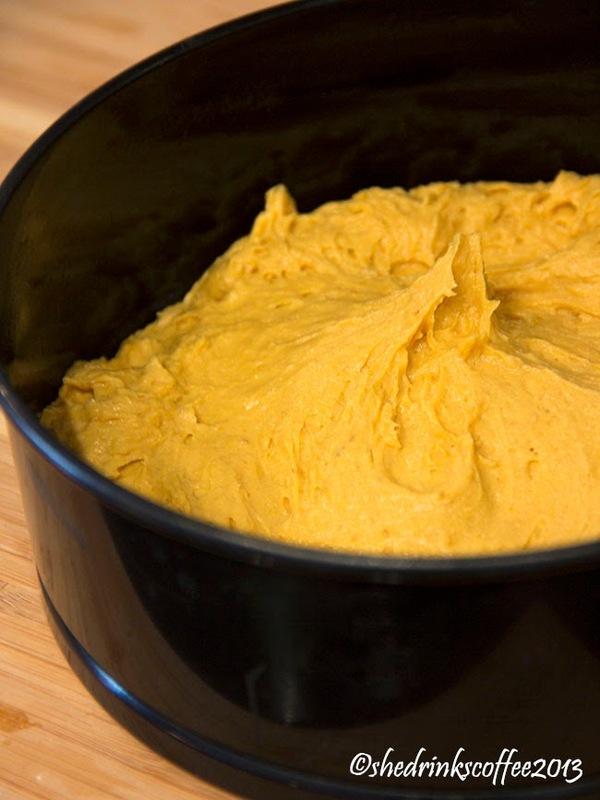 Finally, spoon the topping mixture onto the top layer of cake batter, and lightly pat it down to ensure even covering. Yes, I made two cakes here. A normal sized cake and a mini cake. This recipe will make one large (20cm/8in tin) cake. 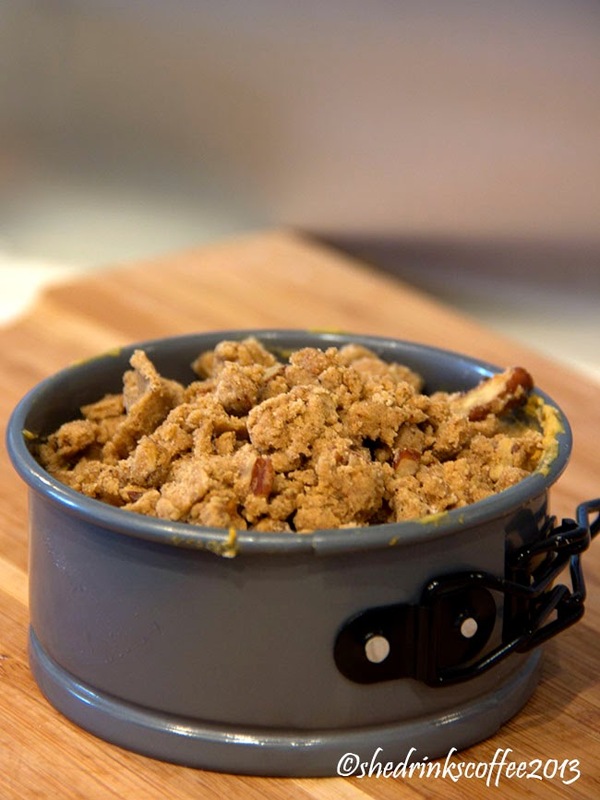 If possible, use a springform cake tin so that you can see the pretty sides of the finished product! Once the topping is all set, pop the cake into the oven and bake for 50-55 minutes. When it's finished, an inserted fork or toothpick should come out clean and the topping should be a nice golden brown color. Let cool for at least 10-15 minutes before removing the side of the springform tin, and another few minutes before slicing, if you at all value cake slices that hold their shape! 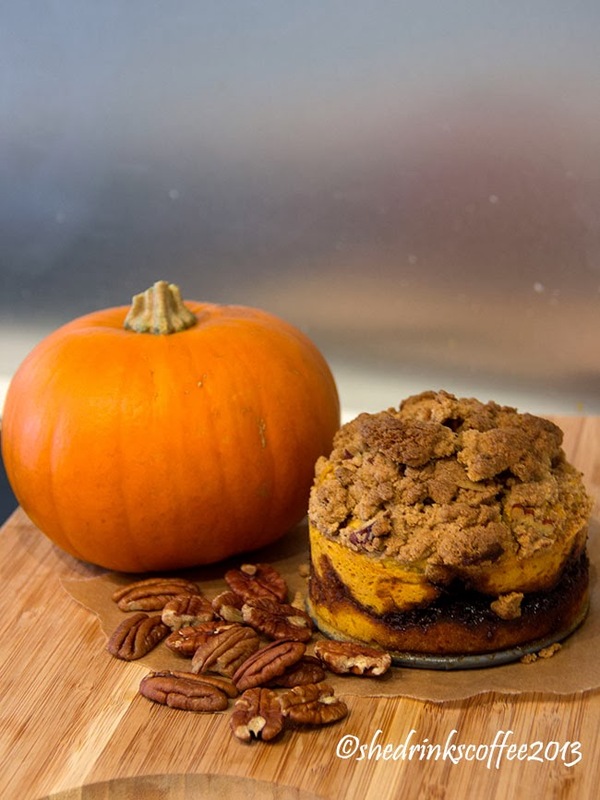 Eat warm and enjoy with coffee; pumpkin decoration optional! 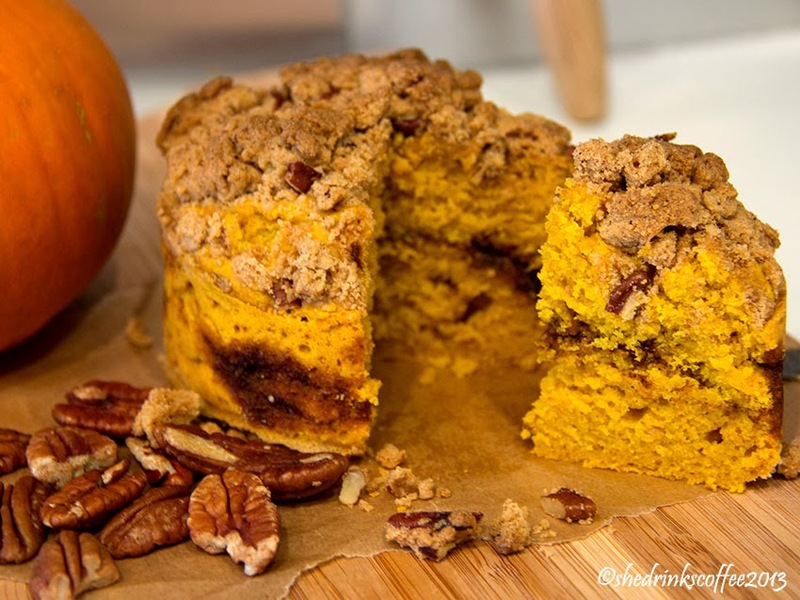 Or have a slice with your morning coffee the next day - it's full of pumpkin, which is a vegetable, so it's almost good for you, right? Sounds like (cake) logic to me!